Have you experienced the conditions in which to print a large number of documents have spent many hours using an inkjet printer? Now it can be solved easily thanks to the presence of a laser printer in our life, one of which is the HP LaserJet Pro CP1025 Color Printer. 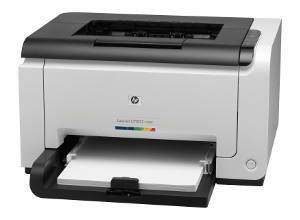 Besides having a high printing speed, this laser printer can also print color documents with adequate print resolution. This is very helpful especially when printing a document that contains graphics and charts. Unfortunately, CP1025 only offer print functions without scanners and connections provided via USB 2.0 only. With a little extra money, you can have a laser printer series with wider connection support that HP LaserJet Pro CP1025nw. The design seems old-fashioned, boxy clad in black and gray on the entire surface. At the bottom-right is the power button, it should have a contrasting color to make it more conspicuous and easy to find. Use is fairly easy, especially for the layman. On the right there are 4 toner buttons, paper feed button, cancel button and indicator lights that indicate error conditions and power.